For 30 years we have written history according to a view that demonized the Marcoses. We have a Constitution that even its framers admit to be an indictment of Marcos. Ninoy Aquino's widow and son became President. 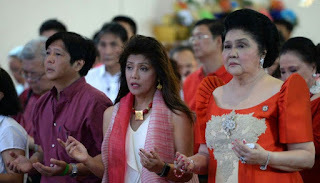 And yet the Marcoses are back not only to power but in good standing in the electorate and in the Court. Marcos Jr. had to be cheated to prevent him from assuming the Vice Presidency. And we say we have failed to teach our children the correct history. If there is a failure, it is not because we have not taught our children the horrors of Martial Law. It is because our post-Marcos governments failed, thereby enabling people to look at the sins of the Marcoses in the context of the sins of the thirty years that we have to endure. People are not stupid. They are wiser enough to know that regimes have good and bad sides, and in their calculations, the Marcos era was more bearable than the post-Marcos years. And we should take notice that this view is held more by people who lived through both periods, and not by the young who tend to be more anti-Marcos and anti-Martial Law, if not apathetic. Antonio Contreras as posted on Facebook. Investigate Omidyar investment in Rappler now!